To commemorate World Health Day (7 April), South Africans have broken a world record for a purpose. Johannesburg, South Africa – Philips South Africa has set a Guinness World Record for the world’s largest GPS drawing by an individual on a bicycle in the shape of a digital heart. The record attempt was undertaken and achieved to commemorate World Health Day (7th April ), and was the finale for the month-long Back to Rhythm campaign that was hosted by Philips South Africa in collaboration with the Philips Foundation and the Heart and Stroke Foundation South Africa, (HSFSA). Kevin Benkenstein, took on Philips’ “Back to Rhythm” challenge to cycle 510 km from Bloemfontein to Kimberley, to Boshof, to Hertzogville, to Bultfontein and back to Bloemfontein, digitally tracking his route to create the world’s largest GPS drawing in the shape of a heart. Kevin and fellow cyclists, Dion Guy and Pieter Seyffertt also cycled across South Africa from Cape Town’s Klein Constantia Estate to the Kyalami Grand Prix Circuit in Johannesburg covering 2,200 km in under 5-days and replicating the pattern of an ECG heartbeat across the varied terrain. They were accompanied by Philips staff on sections of the ride. Both these landmark achievements formed part of a much larger Back to Rhythm campaign, aimed at creating public awareness and education around cardiac health, as well as passing on vital information on training (Cardio Pulmonary Resuscitation), BLS (Basic Life Support) and AED resuscitation, and how to prepare healthier food to ensure better heart health and overall wellbeing. The campaign was then amplified through simple, yet impactful solutions. 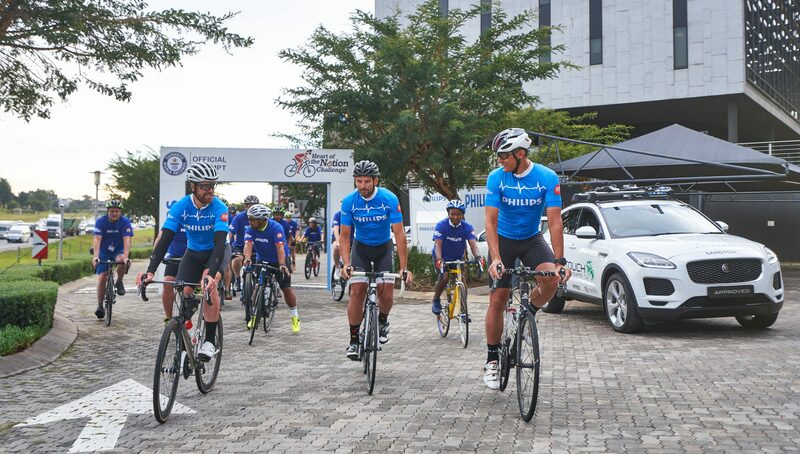 Semi-professional cyclists, Kevin Benkenstein, Dion Guy and Pieter Seyffertt cross the finish line for the Philips Back to Rhythm – Ride to Johannesburg 2019. Phase 1 of the campaign had been running since early March 2019, in communities across Cape Town and Johannesburg. Residents of both cities were encouraged to get active by participating in stationary biking challenges. 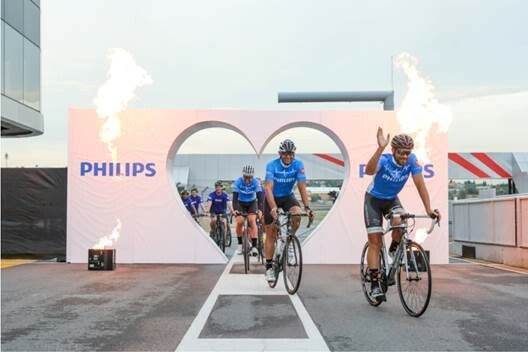 Over 2,000 South Africans participated, each cycling for 10-minutes and a combined total of 8,393 kilometers, securing 25 automated external defibrillators (AEDs) that the Philips Foundation had pledged to the HSFSA. The HSFSA will now place the AEDs in public spaces around the country to equip the members of the public with lifesaving capabilities in case of a Sudden Cardiac Arrest (SCA). 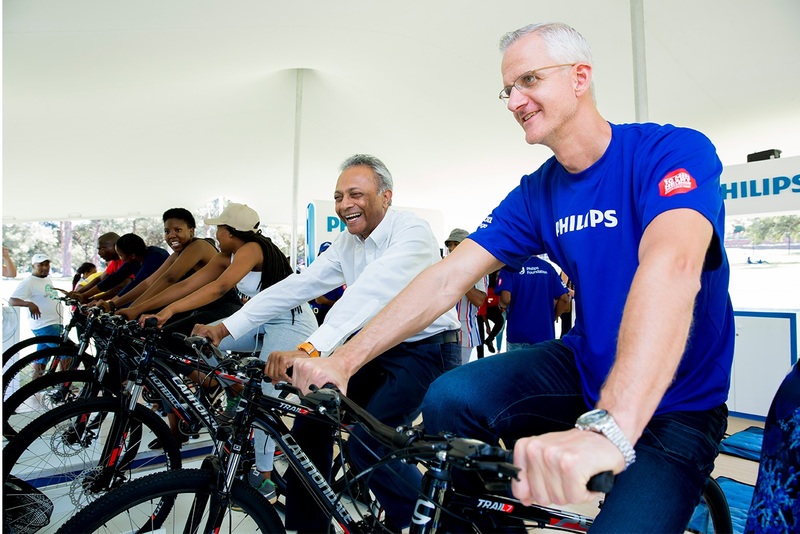 CEO of Philips Africa, Jasper Westerink eagerly taking part in the inspiring initiative. “I can only look back to this achievement with complete pride. It is very rewarding to be a part of an experience where organisations come together to achieve meaningful purpose and impact. I am extremely proud of the fact that we reached such a milestone in South Africa, especially considering that we also set a Guinness World Record in Egypt last year.” says Jasper Westerink, CEO, Philips Africa. “When Philips approached me to take on the challenge to attempt a Guinness World Record to raise awareness on heart health, it really hit home as I lost my father to a cardiovascular disease. 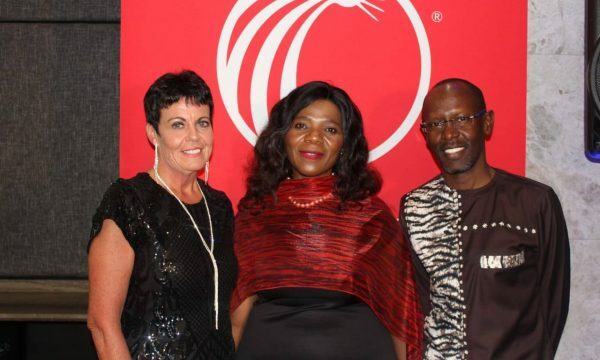 I am proud to have represented such a powerful campaign and hope that South Africans continue to see the importance of healthy living even beyond this campaign and World Health Day,” says Kevin Benkenstein, one of the team members who set the record. “Raising awareness on the growing incidence of CVD; especially SCA and reinforcing the need for a healthy lifestyle and healthy diet are core components of the Back to Rhythm campaign, which will continue with several different informative and educative programmes in the coming months. To successfully drive down future incidences of heart disease, we hope to see these conversations and training sessions bring about sustainable lifestyle changes in local communities; empowering South Africans to live longer, healthier, and more productive lives.” concludes Westerink. Follow #BackToRhythm #RideToJhb on Facebook and Twitter, and get more information on the microsite.